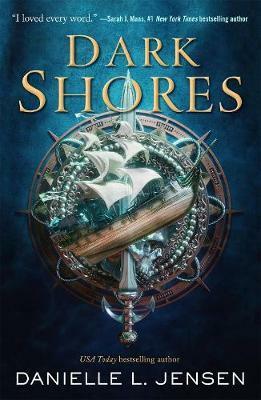 High seas adventure, blackmail, and meddling gods meet in Dark Shores, a thrilling first novel in a fast-paced new YA fantasy series by USA Today bestselling author Danielle L. Jensen. In a world divided by meddlesome gods and treacherous oceans, only the Maarin possess the knowledge to cross the Endless Seas. But they have one mandate: East must never meet West. Teriana is the second mate of the Quincense and heir to the Maarin Triumvirate. Her people are born of the seas and the keepers of its secrets, but when her closest friend is forced into an unwanted betrothal, Teriana breaks her people's mandate so her friend might escape--a choice with devastating consequences. Marcus is the commander of the Thirty-Seventh, the notorious legion that has led the Celendor Empire to conquer the entire East. The legion is his family, but even they don't know the truth he's been hiding since childhood. It's a secret he'll do anything to protect, no matter how much it costs him - and the world. When an Empire senator discovers the existence of the Dark Shores, he captures Teriana's crew and threatens to reveal Marcus's secret unless they sail in pursuit of conquest, forcing the two into an unlikely--and unwilling--alliance. They unite for the sake of their families, but both must decide how far they are willing to go, and how much they are willing to sacrifice.